award in the bronze category of the 2017 edition of the Queens Commonwealth Essay competition. 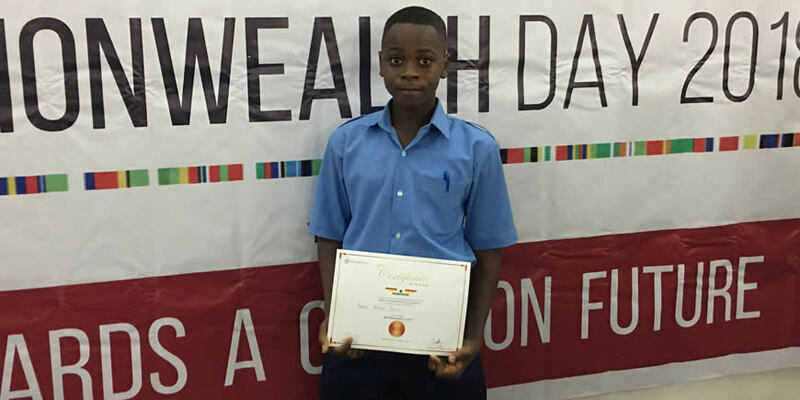 The award was presented at an event held at the premises of the British Council, Accra, under the auspices of the Royal Commonwealth Society (RCS) to commemorate Commonwealth Day. For his prize, he received a Bronze-award Certificate. Speaking in an interview with the VRA News, Master Andy Jecty said, "his desire to see a peaceful world motivated him to participate in the competition." He urged the Management of the Commonwealth of Nations to work harder to bring lasting peace to its member countries especially those in Africa. The aspiring Medical doctor used the opportunity to advise his mates to take their learning seriously and endeavor to participate in future external competitions.